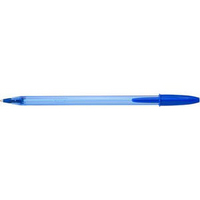 Cristal Soft Medium Ball Point Pen Blue Modern design with cap and end plug matching the ink colour. Light blue transparent barrel. Medium 1. 2mm tip writes a 0. 45mm line width. * Compared to traditional BIC ball pen ink. Approx Dimensions (CM): D15.6 W7.7 H7.7. Approx Weight (KG):0.3.